BACKGROUND: Scholarly research experiences during student life can make pharmacy students capable of reaching the pinnacle of triumph with scientific skills. AIM: The aim of this study is to assess the perception of pharmacy students and their inclination toward scholarly research publications. MATERIALS AND METHODS: A cross-sectional web-based survey was conducted among pharmacy students across India, Malaysia, and Pakistan. A 21-item questionnaire was distributed through different social networking sites between July and September 2016. Descriptive and Chi-square tests were used to analyze the findings. A value of P < 0.05 was considered as statistically significant. RESULTS: Of 543 pharmacy students approached, 348 participants from India, Pakistan, and Malaysia were included giving a response rate of 64%. The study comprises 48.5% of males and 51.4% of females, studying a bachelor of pharmacy (44.5%), and from private institutions (94%). Nearly, three-fourths (76.4%) of the students had no publications but showed high interest toward original research (87.4%). Most of the participants cited the reasons to engage in the scholarly publication is too advanced research/share findings (74.1%), and to improve writing and research skills (73.6%). Further, a significant percentage of students agreed that contributing to the literature during student life as a valuable experience and publishing will provide them with personal fulfilment. CONCLUSIONS: This study showed that most of the pharmacy students had positive perceptions toward scholarly research activities to advance research and improve their writing research skills. We recommend the pharmacy schools to incorporate scholarly activities in the curriculum to embark research-inclusive career. Evidence-based medical education, learning, and practice are highly essential for the current student generations. Providing research-based education to pharmacy students can help them to engage actively in research activities, and an opt for a research-based professional career. Several studies have investigated the pharmacy students' scholarly experiences and research related coursework in their curriculum.,,,, All these studies reported the importance of pharmacy students' involvement in research activities. Scholarly research experiences from the undergraduate level can make pharmacy students capable of reaching the pinnacle of triumph with scientific skills. A paradigm shift in the pharmacy profession toward patient-centered care and drug safety has given a greater opportunity to adopt evidence-based medicine into their practice. Furthermore, research skills are becoming more critical to achieve a decent career and to gain scholarships for higher studies., In 2010, Nykamp et al. study on US pharmacy students concluded that participation in scholarly activities and their authorship in peer-reviewed publications during their early course of career might lead to enhance more interest toward academic pharmacy. Most of the postgraduate pharmacy program have the coursework in research methodology, biostatistics, literature review and evidence-based medicine/pharmacy. The offered courses provide requisite skills to perform scholarly research in an integrated manner and help to strengthen their research skills. In an attempt to nurture emerging pharmacy scientists, many countries have taken initiatives to engage students in research projects by delivering didactic courses in research methods, elective research courses, clerkships, research seminars, and others.,, Engaging students in research activities will develop critical thinking skills to understand the foundations of evidence-based pharmacy practice. Several barriers to this have been identified such as lack of faculty members with appropriate expertise and sufficient time for mentoring, limited resources, and logistic difficulties. With these obstacles, some pharmacy students have pursued their academic research, but unfortunately, most of their confided work remains unpublished. Although the number of scientific journals has drastically increased with increasing area of interest, the contribution of the pharmacy students was very minimal. During the years from 2004 to 2008, the overall number of student-authored manuscripts obtained from various pharmacy journals were found to be 137 articles, and the contribution of student research publications in peer-reviewed journals is lower than 6%. A better understanding of the pharmacy students' perceptions and their interest toward scholarly research activities is essential. In this regard, the study aimed to assess the perception of pharmacy students and inclination toward scholarly research publications. We conducted a cross-sectional web-based survey using Qualitrics™ (www.qualitrics.com) an online survey tool to obtain the data from pharmacy students from India, Malaysia, and Pakistan and distributed from July to September 2016. The study questionnaire was adopted from the previous study conducted on pharmacy and medical students.,,,,,,,,,,,, The survey questionnaire was pilot tested among ten faculties and 20 final pharmacy students to assess the reliability and readability. Minor refinements were made to clarify specific questions. Students who participated in the pilot project were not included in the final study. The final questionnaire was distributed to pharmacy students in India, Malaysia, and Pakistan through Qualitrics online Uniform Resource Locator link using social network sites such as Facebook, LinkedIn, Twitter and personal E-mails were also distributed to the student groups. An online sample size calculator “Creative research systems” was used to determine the survey participants by considering 95% confidence level, with an accuracy of 60% for the unlimited population size given a confidential interval of 4.3, the recommended sample size of 520 or more. By considering 20% dropouts a total of 625 participants were invited to participate in the survey. Participation within these representative sample was completely voluntary, and confidentiality was maintained at all stages by not disclosing any personal information in the survey results. The 21-item questionnaire was divided into five sections. The first section constitutes 8-item related to their demographic information including gender, age, country, current pharmacy student grade, and type of institution. Other background information includes the students' previous journal publication, and the number of publications. In the second section, respondents were asked to rate each item using 3-point Likert scale (high, medium and low). The questions focused on assessing their interest toward the type of research articles and their perceived reasons for scholarly research publications. 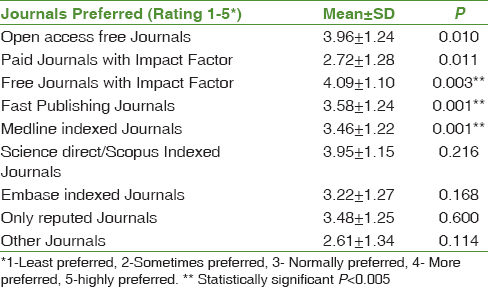 In section three, 10-item related to their preferences toward the type of journals and indexing were used and were rated using five-point Likert scale (1-least preferred to 5-highly preferred). The section four included 10-questions about the value of scholarly publishing and asked to rate them using 5-point Likert scale (5-strongly agree to 1-strongly disagree). The last section constituted 12-items about their perceptions toward the various considerations for scholarly journal publication and was assessed using a 3-point Likert scale (1-low priority to 3-high priority). The inclusion criterion was to include pharmacy students across all years from India, Malaysia, and Pakistan. Questionnaires that were not completed were excluded. All the data were extracted from the Qualitrics online database, and statistical analysis was performed using SPSS® version 21.0 (IBM Corporation, Armonk, NY, USA). Descriptive statistics were used to describe demographics and research background experiences. For ease of reporting, differences using agreement responses of high priority, responses with “agree” and “strongly agree” were grouped. Disagreement responses of low priority, “strongly disagree,” and “disagree” of the Likert scale was utilized. Mann–Whitney U-test was conducted to further analyze the influence of participants' demographic characteristics and their opinions on possible perceptions toward scholarly research activities. A value of P < 0.05 was considered statistically significant. Of 543 pharmacy students approached, 422 participants completed the survey with a response rate of 77.7%. Since, the study focused on pharmacy students from India, Pakistan, and Malaysia; we excluded 74 participants participated from other countries. Hence, the final sample includes 348 (64%) pharmacy students from these three countries. The study sample comprised 48.5% of males and 51.4% of females. Majority of the participants are between 21 and 25-year-old (61.5%), 45.7% from India, studying a bachelor of pharmacy (44.5%), and from private institutions (94%). Unfortunately, more than three-fourths (76.4%) have no previous publications, and only 15% had 1–2 have scholarly research publications [Table 1]. A high percentage (87.4%) of the pharmacy students expressed their high interest towards original research, followed by moderate interest toward review studies (53.7%) and low interest on another type of research publications (46.6%). Moreover, the reasons for scholarly publication is to advanced research/share findings (74.1%), to improve writing and research skills (73.6%), interesting/good experience (71.6%), and for good achievement/goal (71.6%) [Table 2]. The pharmacy students' opinions on journal preferences suggests that they highly prefer free journals with impact factor (47.4%), open access free journals (45.7%), and moderately prefer reputed journals (29.9%), and sometimes or least like to prefer other nonindexed journals (50.3%) for their scholarly research publications [Table 3]. Respondents rated their perception toward the value of publication and influence of mentors is presented in [Table 4]. A significant percentage of the male and female students felt that publishing as a student will provide them personal fulfilment (P = 0.017). A high percentage of students agreed that contributing to the literature during student life as a valuable experience and publishing is an excellent source of recognition for students. Moreover, around 70% of male and 76% of female pharmacy students reported that their mentors encouraged them to research publications, but no statistical significance was noticed (P = 0.207). To the best of our knowledge, this is the first study assessed the perceptions and inclination of pharmacy students toward engaging in scholarly journal publications. 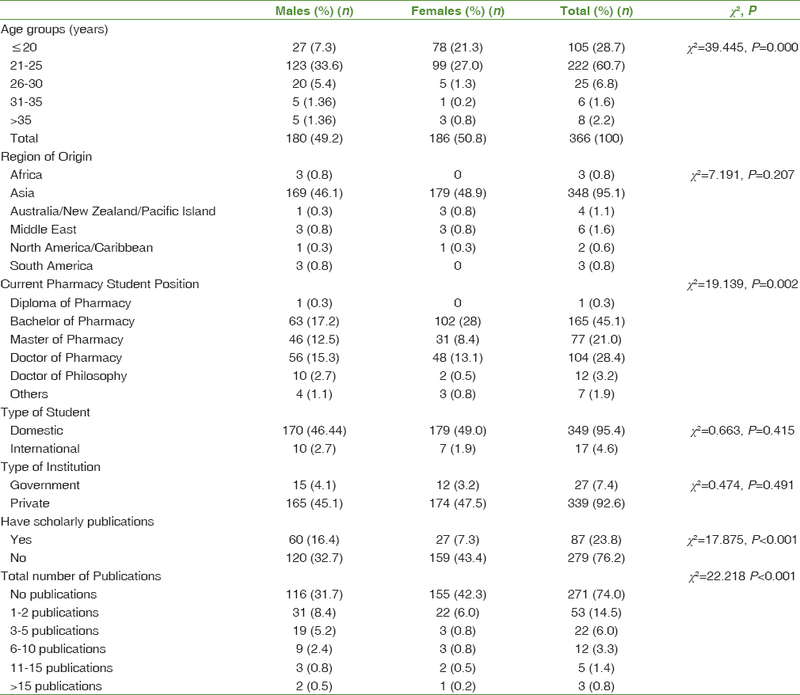 There was only one study describing pharmacy students participation in journal publications. Overall, our participants showed high interest toward original research publications, and to advance research/sharing findings and improve their writing and research skills were some perceived reasons for scholarly journal publications. Furthermore, they would like to prefer free journals with impact factor or open access free journals to publish their research works. Encouraging co-students to publish and writing for publication to gain excellent experience were the two highly rated factors that were considered valuable about scholarly publications. Our results suggested although most of the students did not have any publications but shown high interest toward journal publications. Considering the importance of scholarly research activities, pharmacy schools/colleges can offer an elective training/summer course program that can explore potential publications threads to pursue with pharmacy students. In this way, we believe this can provide ample opportunities toward scholarly activities. In Nykamp et al. study, US pharmacy students identified themselves as the primary authors in 43% of the publications. Compared to our results this finding suggests that US students are more engaged in scholarly research activities than ours. This also was supported by the fact that many countries as Asian countries are still providing traditional pharmacy education. Encouragingly, it is worthy to note that more than 85% of the students reported that they were interested in publishing original article publications to advance research/sharing findings and improve their writing and research skills. These findings are taken together highlighted the attrition of pharmacy students intentions to pursue a research career. Offering research assignments by their faculties to learn how to write a research manuscript and helping them to get it published in scientific journals can improve mentorship relation and mediate interest in future research involvement. Although authoring a publication during student life can increase their desire for future research involvement, our results suggest that majority of students prefer “free journals with impact factor” and “open access free journals” to publish their research works. Many international journals including the British medical journal, Lancet, Public library of Science Medicine are providing opportunities to encourage medical students by including students sections regularly. This has been an excellent platform for students across the world to publish the findings of their research and addressing critical issues affecting health and healthcare. Unfortunately, no such importance was given for students in pharmacy journals. To encourage students, incorporating a thematic issue in pharmacy education journals dedicated to student research can potentially enhance students' scholarly publishing activities. In this study, the most relevant factors to scientific writing included encouraging other students to publish and writing for publication to gain useful experience. This emphasizes the students' passion and the importance of positive research experiences recapitulate the findings of other studies.,,,,, It is advised that faculties need to invest additional time and efforts to navigate their students' career choices and academic advancement to pursuit research trajectory. Indeed, our results also suggest that effective implementation of the scholarly program will necessitate aligning individual students to familiarize with the area and likely to contribute with great abilities to improve critical reasoning skills. It is pertinent that the pharmacy curriculum can accentuate the role of a faculty member as “motivators through regular feedback and polish their research skills,” assisting them in transforming their research coursework into scholarly publications. This is an endorsement of the concept by Abu-Zaid and associates for medical curriculum who advocated the role of course instructors for strengthening research skills of their students. First, the study was conducted online to serve as a benchmark for large-scale research and focused on three countries. Therefore, the findings of our study cannot be generalized for the global pharmacy students. Some limitations need to be considered. First, this is a cross-sectional study and data presented here is self-reported, and some students may provide extreme responses than others, due to the motivations and beliefs, which might lead to recall bias. Second, despite the study instrument was pilot tested, it was not subjected to formal standardization. Furthermore, other factors influencing scholarly activities such as academic infrastructure, type of education system, students engaging and adequate research opportunities need to be evaluated. This study highlights most of the pharmacy students showed positive perception toward scholarly research activities to advance research and improve their writing research skills. Encouraging others to publish and writing for publication to gain good experience is some inclination factors that students considered value about scholarly publications. Pharmacy schools should incorporate scholarly activities in the curriculum to embark research-inclusive career. The authors would like to thank all participants for their support of the project by sharing their views and opinions. Nykamp D, Murphy JE, Marshall LL, Bell A. Pharmacy students' participation in a research experience culminating in journal publication. Am J Pharm Educ 2010;74:47. Ramsauer VP. An elective course to engage pharmacy students in research activities. Am J Pharm Educ 2011;75:138. Vellurattil RP, Puglisi MP, Johnson CL, Slonek J. Introduction of a capstone research program in a new college of pharmacy: student perceptions. Currents in Pharmacy Teaching and Learning. 2014 May 1;6 (3):429-36. Bauman JL, Ascione FJ, Brueggemeier RW, Letendre DE, Roberts JC, Speedie MK, et al. Maintaining pharmacy education's research focus as the academy expands. Am J Pharm Educ 2012;76:144. Kim SE, Whittington JI, Nguyen LM, Ambrose PJ, Corelli RL. Pharmacy students' perceptions of a required senior research project. Am J Pharm Educ 2010;74:190. Kao DJ, Hudmon KS, Corelli RL. Evaluation of a required senior research project in a doctor of pharmacy curriculum. Am J Pharm Educ 2011;75:5. Bhagavathula AS, Sarkar BR, Patel I. Clinical pharmacy practice in developing countries: Focus on India and Pakistan. Arch Pharma Pract 2014;5:91-4. Murphy JE, Slack MK, Boesen KP, Kirking DM. Research-related coursework and research experiences in doctor of pharmacy programs. Am J Pharm Educ 2007;71:113. Stanislaus AC. Qualitrics Survey Research Suite. Available from: http://www.archieve.csustan.edu/IR/documents/QualitricsSurveyResearchSuite_presentation_07312013_WEB.pdf. [Last accessed on 2015 Jul 03]. Hassali MA. Challenges and future directions for public health pharmacy education in developing countries. Am J Pharm Educ 2011;75:195. Amin TT, Kaliyadan F, Al Qattan AE, Al Majed HM, Al Khanjaf SH, et al. Knowledge, attitude and barriers related to participation of medical students in research in three Arab Universities. Educ Med J 2012;4:43-56. Ismail MI, Bazli MY, O'Flynn S. Study on medical student's attitude towards research activities between University College Cork and Universiti Sains Malaysia. Procedia Soc Behav Sci 2014;116:2645-9. Creative Research System. Available from: http://www.surveysystem.com/sscalc.html. [Last accessed on 2015 Jan 14]. Shelton M. Mary Snyder Broussard. Reading, Research, and Writing: Teaching Information Literacy with Process-Based Research Assignments. Vol. 78. Chicago: College Res Libr; 2017. p. 1005. Basnet B, Bhandari A. Investing in medical student's research: Promoting future of evidence based medicine in Nepal. Health Renaissance 2014;11:297-300. Weaver AN, McCaw TR, Fifolt M, Hites L, Lorenz RG. Impact of elective versus required medical school research experiences on career outcomes. J Investig Med 2017;65:942-8. Burgoyne LN, O'Flynn S, Boylan GB. Undergraduate medical research: The student perspective. Med Educ Online 2010;15:5212. DOI: 10.3402/meo.v15i0.5212. Ommering BWC, Dekker FW. Medical students' intrinsic versus extrinsic motivation to engage in research as preparation for residency. Perspect Med Educ 2017;6:366-8. Abu-Zaid A, Bamogaddam I, AlBader L, AlFakhri L, Nurhussen A. A call to encourage curricular research publications by medical students. Int J Med Educ 2016;7:406.